Istanbul is known as the "Queen of Cities", but she is more. During February, the Guardian published two stories focusing on her paradoxes and contradictions. One was headlined "Minarets and martinis"; the other focused on the pull ­-- eloquently portrayed by Turkish novelist Orhan Pamuk -- between the old "(which is usually local and Islamic) and the new (generally Western and secular)". The newspaper dubbed Istanbul "a world in itself consisting of countless villages." 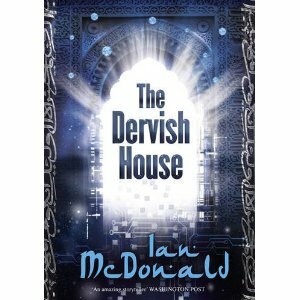 That imagery of microcosm and macrocosm haunts Ian McDonald's new novel, The Dervish House, set in the city in 2027. It recurs in imagery, from the pervasive presence of nanotechnology to the exquisite micro-graphy of an Islamic manuscript, images composed of letters, themselves composed of letters so tiny they have become pixels.